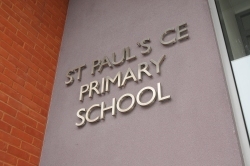 The school has been at the heart of the community of Withington, South Manchester since 1844. In 2012 we continue to meet the needs of our students and their families using the most up to date methods in our state of the art building. We admit 45 children into ever year group from Nursery and Reception through Years 1 to 6. The 84 children in the Nursery and Reception years which form the Foundation Stage are divided by age into three classes in their own area of the school. The 90 children in Years 1 and 2 which form Key Stage One are grouped in three parallel mixed age classes. Similarly in Key Stage Two there are three parallel Year 3/4 classes and three parallel Year 5/6 classes. In each of these stages there is a very strongly developed team approach with teachers and teaching assistants working closely together to plan and implement an effective programme of learning of activities. Within this structure, students are organised into sets for literacy and numeracy lessons to ensure a good match with their ability. We are very proud of our success at meeting the needs of children from a diverse range of backgrounds and children with special educational needs, English as an additional language, serious medical conditions and physical disabilities. (We are privileged to be part of Manchester’s Barrier Free Partnership). We are committed to being a truly inclusive school.